It behooves railways to periodically review tie, fastener and surfacing maintenance practices, particularly as they relate to the planning and quality of rail grinding procedures. The use of technology, enhanced inspections, regular grinding cycles and friction modification can improve rail surface quality. The safety rationale and cost effectiveness of rail grinding programs have become well established over the past 25 years (1). 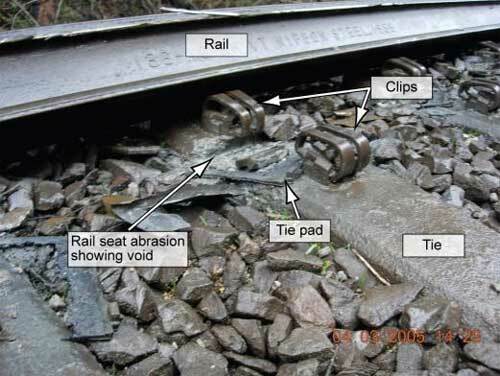 Rail grinding can remove plastic deformation and rolling contact fatigue (RCF) cracks that limit the life of rail (see Figure 1). If defects can be mitigated through grinding or effective rail testing, rail can be worn almost to the web — substantially increasing its service life. Grinding can control corrugation and weld dipping. Smoothing welds reduces dynamic impacts that can reduce a weld’s service life. Grinding can also help manage the wheel/rail contact profiles and steering forces. This is important because improved steering reduces the forces that cause wear and RCF. When combined with a program of lubrication and/or friction modification, rail grinding can double the rail’s wear life (2). It’s a good thing that grinding provides these benefits because it’s expensive — as much as $30,000 per day. The maintenance challenge is to ensure that the money is well spent, and that the program delivers the anticipated benefits. Obtaining the best value from grinding starts with proper inspection and planning. 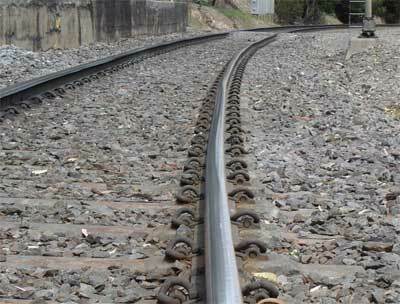 Before beginning a grinding program, maintenance personnel must ensure that the track is in reasonable condition. Grinding will not compensate for wide gauge, or correct tipped rail. In fact, profile grinding tipped rail can cause serious steering problems if the rail is re-set to the proper cant without an immediate re-grind. Grinding also will not improve the ride quality, if the track has poor crosslevel or alignment. • Every type of tie/fastening system wears out; all tie/fastening systems need maintenance over their service life. • The level of deterioration is directly related to the loading over time. • The rate of deterioration is exponential. Poor track deteriorates more quickly. • The lowest lifecycle cost is achieved by timely preventive maintenance. Waiting too long to perform maintenance results in high expenditures for minimal benefits. 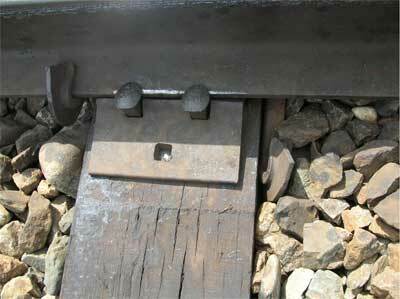 These mechanisms need to be treated differently when correcting gauge and when planning rail grinding programs. If, for example, the gauge is wide primarily because the rail is tipped to the field side, it is difficult to grind the rail for RCF down the center of the head. If the rail is subsequently reset to the proper cant, the profile contact patch will be off-center, seriously affecting steering. Tipped or improperly canted rails need to be reset before grinding. This situation differs from one in which the high rail must be replaced because of gauge-face wear. The low rail, which typically shows signs of false flange contact at the field side of the rail head, must be ground for profile and RCF. In this instance, the existing track would not be re-gauged, as it would be too tight once the high rail is replaced. Track inspection and assessment of the factors contributing to wide gauge are essential to planning an effective rail grinding plan. The North American track structure is experiencing an accelerated deterioration rate from the increasing percentage of 286K loading. Short lines that are becoming 286K-capable must focus on more than just the bridges. Even on lines with an infrastructure that is currently handling heavy-haul traffic, the increasing use of AC locomotives, which generate higher longitudinal loads, continues to up the ante. Subsurface support is critical as axle loads increase. On some of the iron ore railways in Western Australia, for example, which handle heavier 35- to 40-tonne axle loads, very small deviations in track support have almost immediate effects on rail surface. 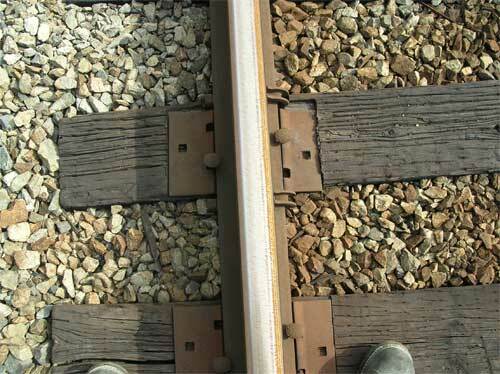 Contaminated ballast and poor drainage provide poor track support, causing ties and rail to wear, requiring maintenance or replacement sooner than expected. Oddly enough, these areas typically get the least overall inspection. Inspectors tend to fly by some of the worst parts of the track structure (tunnels, muddy areas, etc) instead of getting out and into the mud, and planning for repairs. Arbitrarily running a grinder through areas without reference to the track structure can do more harm than good (see Figure 7). 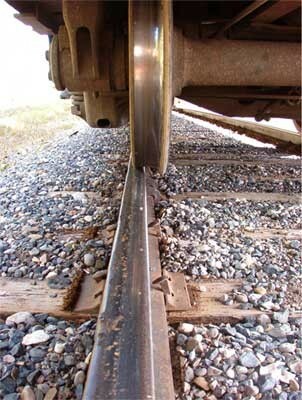 Incorrect rail profiles cause hard steering and accelerated wear on rail and wheels. Grinding also dries out the surface of the rail. This raises the coefficient of friction on the rail from the optimum 0.3 to 0.6 or greater. 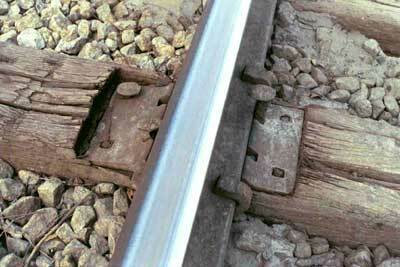 If the track structure is weak, this can result in rail rollover derailments. And as previously noted, grinding tipped rail is a waste of material, as the rail must be re-ground to avoid causing severe steering forces when the rail is reset to the proper cant. • Only grind where the track structure is strong enough and in good enough condition to benefit from the effort and expenditure. • Determine the optimum point to correct wide gauge by understanding the underlying cause at each location. Optical measurement systems can identify when wide gauge is due to tipping, lateral movement or rail wear, for example. • Correct the gauge sooner. FRA safety standards are not the optimum maintenance point. • Devote more effort to marking and changing defective ties. A “junior” inspector typically performs the tie inspection work that is responsible for millions in expenditures. Marked ties and inspection results should be reviewed in advance of all replacement programs to ensure that bad tie clusters are eliminated and that there are good ties under joints and welds. • Consider that a timely expenditure of thousands of dollars in regular Maintenance spending might defer millions of dollars in Capital spending, several years later.